Kyle and Jen, estranged siblings, travel from New York City to rural Pennsylvania to pack up the home of their recently deceased mother. While there, they make a discovery that turns their world upside-down. 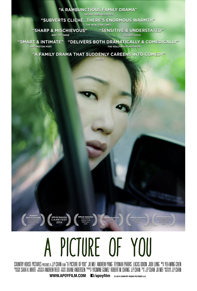 A Picture of You is a serious movie about life that gets sideswiped in the supermarket parking lot by a funny movie about death. It’s a story about family, loss, secrets, letting go, and starting anew. Director J. P. Chan joins us to talk about his very entertaining film, the travails of funding an indie film and revelatory power of creativity. Q & A with director J. P. Chan Saturday, September 13th and Sunday, September 14th at the Laemmele Playhouse 7 in Pasadena!